"2018 volumes almost approached the cyclical bottom of 2015, when the economy was in recession. The main reason for this decline is the caution of investors triggered by the sanctions against Russia, volatility in emerging markets and the oil price drop. The postponement of some large transactions into 2019 intensified the 2018 investment volume decline. 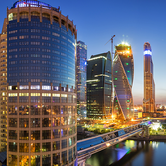 Nevertheless, unlike in 2015, the debt market in Russia is healthy, senior debt financing is available at relatively low interest rates causing an ironic shortage of real estate products available for purchase", said Natalia Tischendorf, Head of Capital Markets, JLL, Russia & CIS. 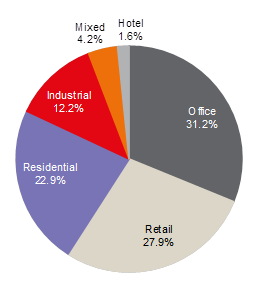 In 2018, the office sector received the most investor attention, with 31% of the total volume. Among large office deals were the acquisition of Legion I BC by FC Otkritie for its own use, and the investment purchase of Metropolis office building by Hines and PPF Real Estate. 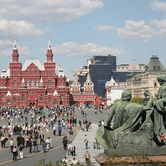 The retail sector accounted for 28% of investments; the largest deal was the purchase of the Riviera SEC in Moscow. The residential sector (land plots for residential development) accounted for 23% of the total volume, up from 11% in 2017. St. Petersburg continued to increase its share in 2018, to 23% from 17% in 2017 and 9% in 2016, although its volume had declined slightly in absolute terms. The Moscow share dropped to 66% from 78% in 2017. The share of regional investments reached 11% of the country's volume versus 5% in 2017. Among notable regional transactions last year were the warehouse purchase by Raven Property Group in Nizhniy Novgorod, the Murmansk Mall acquisition in Murmansk, and KomsoMALL in Volgograd. 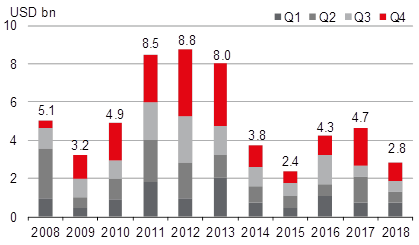 While the foreign capital share in executed transactions increased to 28% in 2018 from 18% a year earlier, the absolute figures were similar, at $793m and $823m respectively. The acquisition of Riviera SEC by KLS Eurasia Venture Fund from Kyrgyzstan became the largest 2018 deal by a foreign investor. The second largest deal done by foreign capital was the purchase of 12 K-Rauta stores by the French retailer Leroy Merlin. 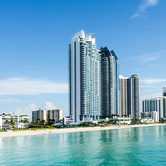 The purchase of a Metropolis office building by Hines and PPF Real Estate took the third place last year among transactions with foreign capital. 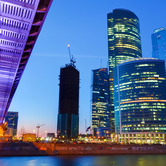 Olesya Dzuba, Head of Research, JLL, Russia & CIS, also commented, "Russia economic growth in 2019 will remain at 1.5-1.7%, still limited by sanctions and the resulting uncertainty and volatility. Although there is no basis to expect an explosive growth of real estate investment transactions, the low 2018 base and the postponement of some deals may result in a 25% investment increase. As such, we forecast the 2019 investment to reach $3.5bn."